Now you can take a snooze wherever, and whenever. Need a gift for Dad this year? 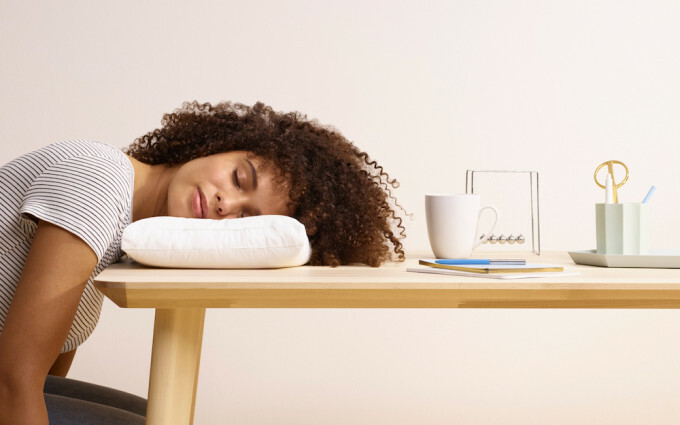 Casper has introduced a new product today — the Casper Nap Pillow, a small pillow that you can carry in your bag. The sleeping startup is designed to tag along with you to work, the subway, the plane, or anywhere else you want to catch a couple of Zs throughout the day. The mattress and bedding industry is a competitive one, with many people debating leesa vs casper for their next mattress. Casper hopes that this pillow will put them ahead of the game. This travel pillow would have come in handy back in college. “The long-term vision of the brand [is] to help people sleep better, whether in your bedroom, in the air, wherever that may be,” said co-founder and Chief Operating Officer Neil Parikh. The Casper Nap Pillow is designed to help you take comfortable, effective naps wherever, whenever you want. Parikh said the travel pillow was created by the company’s research division Casper Labs. It’s basically a shrunk-down version (10.25 inches by 15 inches) of the regular Casper pillow, deploying what the company calls its “pillow-in-a-pillow design” — namely, combining a supportive inner layer with a fluffier outer layer. Each nap pillow is made with silky microfibers and is dual-layered with polyester. Breathable percale cotton makes it possible to “sleep cool,” so even if you’re a sweaty sleeper, there’ll be no evidence of moisture when you wake up. The pillow also comes with a 3-year warranty, guaranteed. Not a fan of carrying a pillow around? But Casper, which started in mattresses and has since expanded to pillows, sheets, and even dog mattresses, believes there’s a need for such a pillow. And since the Nap Pillow is washable, you can toss it in to the wash to ensure you’re always napping on a clean surface. Casper’s $35, guinea pig-friendly Nap Pillow is available now on the company’s website.